Minnesota walleye guide Jonny Petrowski plies his trade in the Rainy River area. This includes Upper Red Lake and, during the spring spawning run, the Rainy River, which flows into Lake of the Woods. From ice out to mid April, before Minnesota's walleye season closes for a month, Petrowski jig fishes the Rainy River. During this brief interlude, he puts his clients in touch with slews of walleyes that weigh 6 to 9 pounds and more. Lindy's X-Change Jig System has made Petrowski's river fishing easier and far more productive. On any given day, he fishes different depths and varying current speeds in the Rainy River. "The X-Change Jig is heaven sent," Petrowski says. "Especially for guiding where I've got to change four or five jigs at once." Since there's no need to retie with the X-Change Jig, Petrowski can quickly switch jig weights and colors. This saves loads of fishing time and prevents his fingers from going numb while tying knots on a windy day in subfreezing temperatures. "The X-Change Jig is also a huge space saver," Petrowski says. "I can fit all the jigheads I need in a little box that slips into my pocket." Since bog runoff puts a perpetual stain in the Rainy River, Petrowski opts for bright jig colors. Patriot is one of his favorites. Should he need to change colors, he can do so in seconds. In the frigid, early spring water, lethargic walleyes respond well to jigs dressed with rainbow chubs, small creek chubs or frozen shiners. Later in the season, when the water climbs near 50 degrees, Petrowski forgoes minnows for soft plastic dressings. The walleyes lie in places where they can hold just out of the river's flow, yet pick off any baitfish the current pushes their way. Petrowski finds walleyes behind current breaks, such as large bounders, and at the heads and tails of deep holes. "I usually catch them 10 to 20 feet deep on Rainy," Petrowski says. "They like to stay where they can feed and rest." Vertical jigging while drifting with the current accounts for most of the walleyes that Petrowski nets. Because the boat drifts downstream faster than then jigs do, Petrowski slows the boat with a bow electric motor. This keeps the fishing lines nearly vertical, which is crucial. This tactic is called slipping the current. Before he instructs his clients to drop their jigs to the bottom, Petrowski lets his boat drift unhindered with the current. This lets him read the current's speed on his GPS. If the current is, say, 2.7 mph, Petrowski sets the cruise control on his i-Pilot Minn Kota electric motor to the same speed. "It takes the error out of trying to match the current," Petrowski says. "That helps me fish the lightest jig possible." A stiff 6-foot, 6-inch, or 7-foot, 2-inch, spinning outfit subdues Rainy River's heavyweight walleyes. An 8- or 10-pound test super braid slices through the current and improves sensitivity. Petrowski usually begins vertical jigging with a 3/8-ounce X-Change Jig. If the jig is making good bottom contact, he drops to a 1/4-ounce jig. This adjustment is quick and easy to make, thanks to the X-Change Jig. From there, Petrowski makes whatever jighead adjustments are needed to perfectly match the current. Lindy's Fuzz-E-Grub gets the call when Minnesota's Paul Fournier targets prespawn walleyes in lakes. 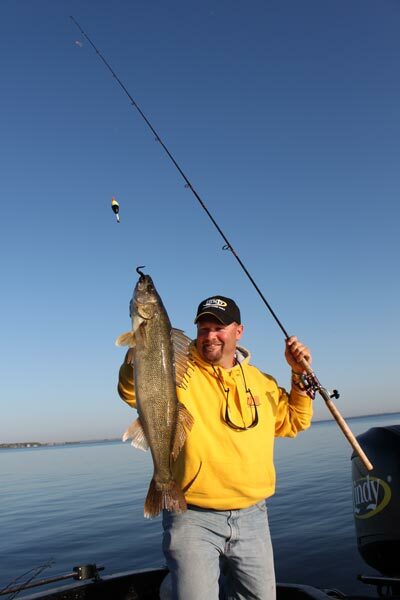 Fournier is a fishing guide, walleye tournament angler,a writer and a Lindy Pro Staff member. He believes cold, sluggish, prespawn walleyes hold the Fuzz-E-Grub longer due to its soft body. The Fuzz-E-Grub's marabou tail is another major plus. The slightest jig movement brings the marabou to life. "The marabou also holds the spray-on scents I use for a long time," Fournier says. "I can still see a scent slick coming off the tail after four or five casts." A double barb on the hook's shank holds the Fuzz-E-Grub's plastic body securely in place. The hook's wide gap ensures solid hookups, even when the jig is tipped with live bait. When he's fishing a clear lake where the water temperature is in the mid to upper 40s, Fournier tips his Fuzz-E-Grub with a fathead minnow. On large, colder bodies of water, such as Mille Lacs and Leech Lake, he goes with a small shiner minnow. Fournier hooks a minnow through the lips when he works the jig with a gentle lift-pause action. "If I'm using more of a swimming presentation, I run the hook in the mouth and out the minnow's head," Fournier says. Before he casts the first jig, Fournier looks for walleyes on sandy flats, rocky points and reefs with his LCG. Then he comes back and fishes the places where he marked the most fish. Arches a foot or so above the bottom tell him that the walleyes are actively feeding. Fournier generally finds prespawn walleyes less than 6 feet deep. In water this shallow, the coverage from a transducer is very narrow and the LCG marks only a fraction of the walleyes in a given area. "You don't need to see a bunch of fish to know there's a good school there," Fournier says. "The ones you do see tell you where they are in relation to the structure." Should Fournier find walleyes relating to rocks and weeds, he casts his Fuzz-E-Grub with a 7-foot, soft-action spinning rod matched with a 10-pound super braid. If the bottom is less abrasive, he opts for a fast-action, 6-foot, 6-inch, spinning outfit with 6-pound fluorocarbon line. The wind dictates the jig's weight. Fournier goes as light as 1/8 ounce on flat, calm days and as heavy as 3/4-ounce when it's windy. Green, chartreuse and other bright hues draw more strikes on sunny days, while black and purple fare better on dark days. "I start by dragging the jig slowly over the bottom," Fournier says. "I'll occasionally lift it up and let it drop back down." If that ploy doesn't work, Fournier employs a gentle lift-pause presentation. That usually puts a few walleyes in the boat. "Aggressive walleyes will be hooked deep," Fournier says. "When I see that, I swim the jig within a foot of the bottom." The upbeat swimming pace covers more water, yet it isn't too fast to tempt bites from feeding walleyes.